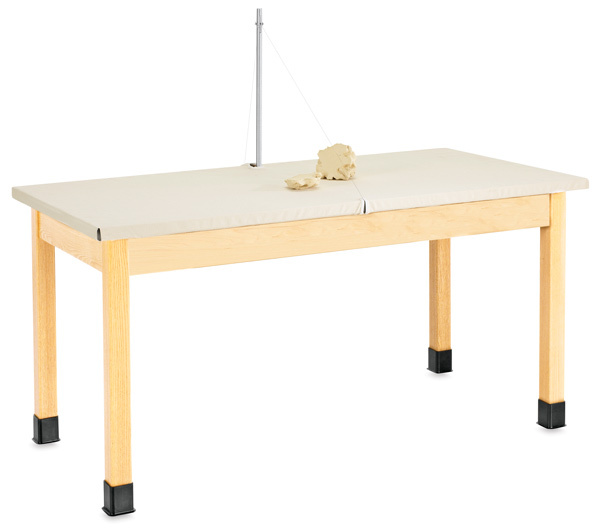 Developed with teacher input, this is the ultimate table for working with clay. The Clay Wedging Table has a solid maple apron and legs reflecting Diversified Woodcrafts' tradition of quality — but the standout feature is the canvas top. It's held on with hook and loop fasteners, which make it easy to remove, clean, and reattach. A clay cutter is also wire-mounted to the top and secured with a twist-lock fastener, so if the wire stretches, you can easily tighten it again. The generous (60" × 30") work surface below the canvas cover is made of sturdy, 1¼" thick plastic laminate.